Course Information Designed by J.Michael Poellot, who is reknown as a partner of R.T.Jones Jr. This is a scotish links type forest course. Every hole is characteristic and no same layout. A very beautiful contrast of clear water, lush green and white sand. Fairways are undulating, and lots of creeks and ponds are strategically placed. This course is located near Narita International Airport and good for the play before taking a flight. 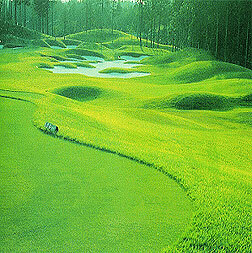 E-golf rated this course as No.73 in Japan's top 100 golf courses in 2006.